The journalist whose name has become synonymous with a new style of public protest has been released from jail in Iraq. Last December, Muntadar al-Zaidi threw his shoe at the former US President George Bush - an act that left an indelible mark on the collective consciousness of protesters the world over. Since that protest, "shoe-ing" appears to have become the favoured protest statement from Ahmedabad to Latvia. Such incidents have inspired comedy shows, video games and social networking groups. Even the month-long Indian general election in April succumbed to what one commentator described as the "ultimate non-violent weapon". "Popular acts of communication and protests enter new forms of relationships with audiences and global spectators beyond the political context and the shoe-throwing incident is no exception. "It has been consummately appropriated into popular culture and entertainment in the multimedia platforms of the internet, transforming political images and political protests into voyeuristic entertainment for the masses." Even Brazilian President Luiz Inacio Lula da Silva found the shoe metaphor too good to pass up. Just days after the Bush incident, at a meeting of presidents and top officials from Latin America, he jokingly threatened to throw a shoe at Venezuelan President Hugo Chavez, Mr Bush's then fiercest critic in Latin America, if he spoke beyond his allotted time. Elsewhere, the New Year was heralded with two separate shoe-throwing protests on the same day. In Sarajevo on 3 January, a few hundred Bosnian protesters vented their spleen at effigies of leading Croat, Muslim and Serb politicians. Shoes had been provided by the organisers. And in London - to the chants of "Shame on you, have my shoe" - demonstrators threw some 1,000 shoes at the official residence of Prime Minister Gordon Brown, in protest against British inaction in Gaza. 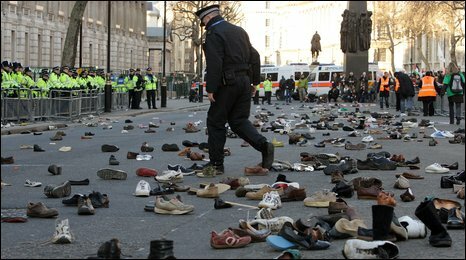 Scotland Yard said at the time that its police officers were "not troubled" by the shoe throwing. A similarly phlegmatic approach was taken by court officials in Cambridge, UK, in June, when they found that there was insufficient evidence to prove that a German student who had hurled a shoe at Chinese Premier Wen Jiabao had intended to cause harassment, alarm or distress. Martin Jahnke had been attending a lecture by Mr Wen in Cambridge in February, when the student branded the Chinese leader a "dictator" and threw a trainer. He missed him by a few metres. Mr Jahnke explained that he thought that just placing the shoe on the stage would be "universally understood". 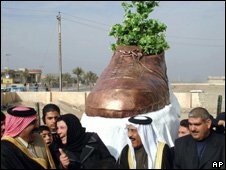 He defended his protest as a symbolic act of defiance, and said he had been inspired by the the notorious shoe attack on Mr Bush. In China, some newspapers expressed anger over the incident while others praised the calm response of both citizens of mainland China and Premier Wen himself. The Israeli ambassador to Sweden was also the target of a shoe-missile - this one actually made contact - while he was addressing an audience in Stockholm University. Even the usually sober confines of the boardroom have not escaped the shoe throwers. In April, in a move that gave a new meaning to the phrase "voting with their feet", shoes were aimed at board members of the troubled Belgian-Dutch financial group, Fortis, during a meeting of shareholders in Ghent. But the most prolonged shoe-throwing campaign emerged in India during the general election. In one incident, the perpetrator was none other than a Hindu sadhu, or holy man, who hurled his footwear at a prime ministerial candidate. In another, a 21-year-old computer scientist took aim at Prime Minister Manmohan Singh at a rally in the western city of Ahmedabad. A journalist who threw a shoe at India's Home Minister P Chidambaram, during a news conference in the capital Delhi, later said he should not have chucked his shoe but had been "emotionally overtaken". Some commentators hailed the fact that no-one was jailed for these incidents as sign of the health of the world's largest democracy. Others suggested that by "forgiving" the shoe throwers, the politicians had denied the perpetrators the chance to become heroes. By May, the throwing of shoes as a sign of protest had caught on in Kuala Lumpur. In one incident, some 500 Malaysians threw footwear at an effigy of Sri Lankan President Mahinda Rajapakse outside the UN building, to protest the killing of civilians by the Sri Lankan government in its war against the Tamil Tiger rebels. Since then, few incidents of shoe-throwing protests have been reported. But the speed with which Mr Zaidi's protest became a global phenomenon indicates it is unlikely they will go away.